Did the controversial comic cross the line with this one? American comedian Kathy Griffin apologised after getting in BIG trouble with the secret service for a violent photo featuring her and Donald Trump’s severed, bloody head. Griffin collaborated with photographer Tyler Shields for the photo shoot, which included her holding up a gruesome fake head resembling the President. The image is shocking, and it’s understandable that it has incited a significant backlash. In a behind the scenes snippet, which was filmed before the photo was released, Griffin can be heard bracing for the outcome of her actions. Since the photo was posted, Twitter has erupted with names like Chelsea Clinton and even the secret service throwing in their very upset two cents. While this image incites violent against a sitting president and that is a pretty terrible move on Griffin’s part, lest we forget the times Trump promoted violence against Hillary Clinton. Trump also threatened violence against protesters at his campaign rallies. “You know, part of the problem and part of the reason it takes so long is nobody wants to hurt each other anymore, right?” he explained during a 2016 campaign event in Missouri while protesters were being escorted out. 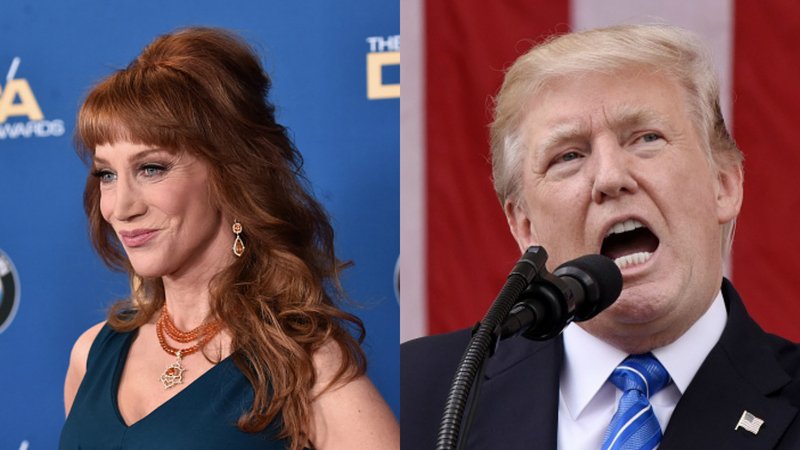 While what Griffin did was not okay by any stretch, neither is the rhetoric Trump promotes. Violence in any form is not acceptable.